The foot of the lake in the village where I grew up. Have you ever noticed how some things remind you instantly of your childhood? It can be a walk on a favourite beach, or a woodland trail, springtime birds singing, or the sounds of your parents starting the day downstairs while you are still in bed. These are favourites of mine, but the ones that bring memories of home the strongest are the smells and taste of old time baking. Don’t get me wrong, I love new recipes and their unfamiliar aromas and exotic tastes. But baked goods from when you were a kid… they’re in a whole other league. Part of "the coner" in the village. This post gives you the opportunity to go back with me to Elementary school. The village where I grew up had (and still has) an exceptional two room school; when I went there Primary to Grade 3 was in one room, 4 to 6 in the other. My mother taught P-3. Some of my fondest memories were the days we brought in home baked goodies. It wasn’t a fund raiser, as such. Our parents sent freshly baked squares, cookies and cakes for us to enjoy. Honestly, I can’t remember if we had to pay anything or not. If so, it was a pittance. All the offerings were great, but one of the star attractions was my cousin’s grandmother’s treats. Dot Bolivar was an amazing baker, among many other things. There was great anticipation for whatever she made. Would it be Doo Dogs, or those fabulous chocolate chip cookies? It really didn’t matter. The recipes were closely guarded secrets for many years, but as she grew older the recipes began to trickle out to those of us who were no longer in Elementary, but missed those wonderful recipes and all they meant to us. It's important to preserve the past, and one such way is to pay homage to our favourite recipes. Protect your culinary heritage and keep those recipes in reverence. That is why I am sharing these with you. I’m certain they may stir a memory or two in you as well. There’s two secrets here. Both seem absolutely wrong, but it works. The first is using margarine, not butter. The other is to not cream the margarine and sugar until light and fluffy. If you do, this recipe won’t work. Follow the directions and your reward will be a pliable, chewy masterpiece. Preheat the oven to 350°F and adjust your oven rack to the centre. Combine the margarine with the sugars. Cream only for 2 minutes. Add the egg and mix well. Add the flour, salt and baking powder. 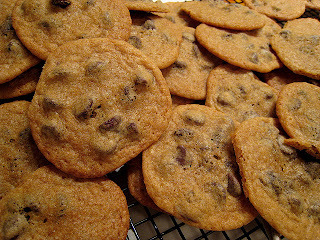 Then beat in the vanilla and chocolate chips. Drop by heaping teaspoons onto a cookie sheet. These will spread a lot so space out accordingly. Bake for 12 minutes, buck check at 10 minutes. Do not allow to dry out. Place cookies on a rack to cool, if they last that long. 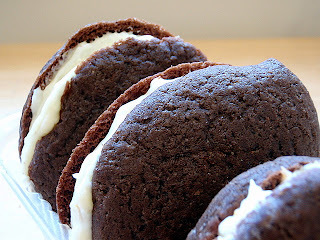 If you like chocolate cake and marshmallow “Fluff”, you’ll love these filled little cakes. These also go by the name of "whoopie pies", but we never called them that. They're "doo" dogs to us. I'm sure you won't eat just one! Cream together butter and sugar until light and fluffy. Add the egg and beat until smooth. Sift together the flour, baking soda, baking powder and salt. Add in 3 portions to batter. Sti in the milk. Add sifted cocoa and vanilla and beat well. Drop batter by tablespoons onto a baking sheet. Bake for 7-8 minutes. They will be rounded, but not browned. Remove to a rack and allow to cool. Combine butter, icing sugar and fluff. Spread on the underside of one “dog” and top with another to make a sweet, sweet sandwich. Mmm I can almost taste them now. Nice piece and some nice memories this dreary Sunday morning!